There is a Ugandan proverb that says “Plants grow according to their soil.” In the 10th grade ELA classroom at Haynes PCS that I share with my inspiring co-teacher Julelah Fuller, we take this to mean that setting up the environment for learning in a meaningful and deliberate way will yield better results for our students. We started out the week by introducing and discussing the Black Lives Matter Guiding Principles by slightly modifying an Introductory Lesson from the BLM at Schools recommended curriculum. While many students know about the Black Lives Matter movement, most are not clear about when it started and what it stands for. The principles gave us the opportunity to provide an overview as we discussed various topics such as intersectionality and collective value; traditional and non-traditional ways of defining family; and the value of different voices within a movement. We each came away with a sense of value for the diversity encompassed by Black Lives. 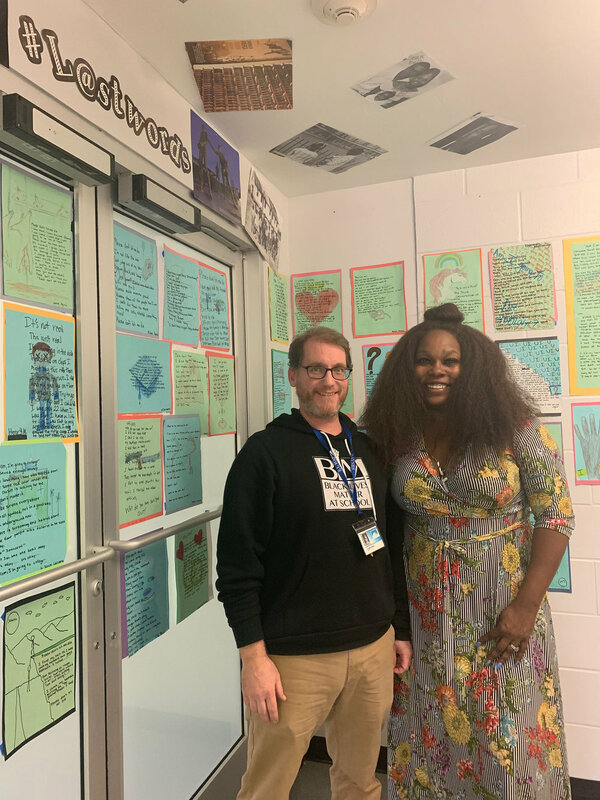 Because we are in the middle of a unit on poetry, we worked with PEN/Faulkner’s Writers in Schools program to bring two local poets to the classroom. We received personal copies of Haint by Teri Ellen Cross Davis. in advance of her visit. In order to prepare, we read a number of poems that explore the themes of family history and finding moments of joy. While visiting the classroom, Ms. Cross Davis read from her book and engaged students in a writing prompt that focused on these moments of joy as resistance. Students are using this prompt to add to their culminating poetry portfolio that is due at the end of the unity. As we continued to read from Haint after the visit, students are more engaged in their close reading because they have met the author in person. As we studied poems by Teri Ellen Cross Davis and Alan King (our Thursday visitor) throughout the week, students also participated in a modified version a lesson called #LastWords. In this lesson, students created images for a series of phrases which are the last words of people of color killed by police officers. After creating the images, students chose one of the victims to research. After the brief research, students wrote poems for their portfolio that begin and end with the last words of the person they chose. Students learned and shared their knowledge about Sean Bell, Amadou Diallo, Michael Brown, and others as they crafted and polished their poems. Alan King’s visit took on a slightly different flavor than Ms. Cross Davis’ visit earlier in the week. Mr. King’s book Point Blank enabled us to examine stereotypes and the experiences in his life that led him to write poetry. By highlighting these experiences, students felt validated to write about their own experience as well. By meeting and interacting with writers of color, students began to feel more comfortable with seeing their own selves as writers. Each visit culminated with pictures with the authors and books signed to the students. Our culminating activity for the week was to create graphic memorials for our #lastwords poems. Each student took their original image and re-created it on larger paper. They then wrote their poems over the image and mounted them to hang outside our classroom. It was a challenge for some to complete these projects in the time allotted, but students wanted to complete their work. When the final bell rang on Friday, our classroom was still full of students who wanted to stay or came back to complete their work. Ms. Fuller and I took this final push, students working by choice after school ends on a Friday, as a sign that the week was a success. It was a week of learning and discovery. It was a creative week of engagement which laid the groundwork for more fertile discussions throughout the year. It was a week which, we think, has created soil that will continue to help our students grow like we know they can.